A tasty cocktail shared with friends tends to be another mood booster. Tonight at happy hour, order a Tequila Sunrise. While there are many variations, the one that really tickled our fancy was the one from the Fine Living Network. 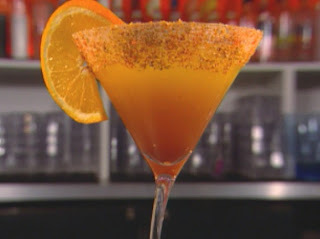 It combines Partida Reposado Tequila, orange juice and grenadine, with a cayenne, salt and sugar rim. That equals a really sweet drink with a spicy kick. However tasty it is, don't forget it's still tequila. We wouldn't want you doing the Pee Wee Herman atop a bar table in 6 inch heels, right?